We grew up with pecan trees in the yard, so we had pecan pies often. If mom was willing to make pies, all “the kids” were certainly willing to pick up and crack out the nuts. We went through a lot of nut crackers, and my dad kept buying new and improved crackers. As we grew up and moved out, he continued to crack out nuts with his various crackers. 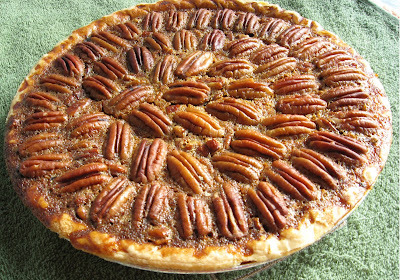 And, mom kept making pecan pies but mostly at holidays when the family headed back to visit. There are loads of variations on the basic pecan recipe, but I’d say that I like the traditional southern recipe the best. It’s simply hard to improve on something so delicious. Cream the sugar and butter well in a medium sized mixing bowl. Add syrup, salt, and vanilla. Mix again. Add eggs one at a time and mix after each. Stir in pecans (or you can place them on top if you want). Pour mixture into pie crust. Do not bake the pie crust first for this one. Preheat oven to 350 degrees F. Bake for 45 minutes. The only real problem I’ve ever seen with pecan pies is them not “setting” (or firming up). I’m not completely sure why this happens. I think the pies are less likely to firm up if the corn syrup is old and also if the filling is not mixed well. I use fresh syrup and do not double the recipe. If I want two pies, I mix each up separate. When using pecan pieces, stirring them in works well. They rise up to the top during the cooking. For whole pieces, you can do the same. But, you can get a nice, neat pattern if you place the nuts on by hand after pouring the sugar batter in the pie crust. Some people like vanilla ice cream on top of pecan pie. Some just like it plain. It's great either way. Leftovers can be stored in the refrigerator (if you have any left over). Microwave a slice for 10 seconds or so to take the chill off.